It is replaced by the Symbol WT4090. Symbol Technologies' WSS 1040, WSS 1049 Wearable Scanning System empowers users to achieve totally new levels of productivity and accuracy. At the same time advanced ergonomics make the system easy to use and comfortable to wear. Never before could scanning portable computing and wireless networking be performed while the user's hands remained totally free for handling packages products inventory or materials. The WSS 1040, WSS 1049 System also represents breakthroughs in miniaturization performance and data transmission. Already its all-encompassing capabilities are changing the definition of productivity and ease of use in warehousing transportation-logistics manufacturing retailing and other industries. The WSS 1040, WSS 1049 System consists of two components. The RS 1 Ring Scanner is worn on the index finger and activated by pointing the finger at the barcode while pressing the thumb against a trigger at the base of the finger. Scanning is performed by pointing the finger at the barcode and activating the scanner by pressing the thumb against a trigger at the base of the finger. The RS 1 Ring Scanner is the smallest wearable laser scanner in the world weighing only 1.7 ounces-48 grams and standing just.9 inches-23 mm high. 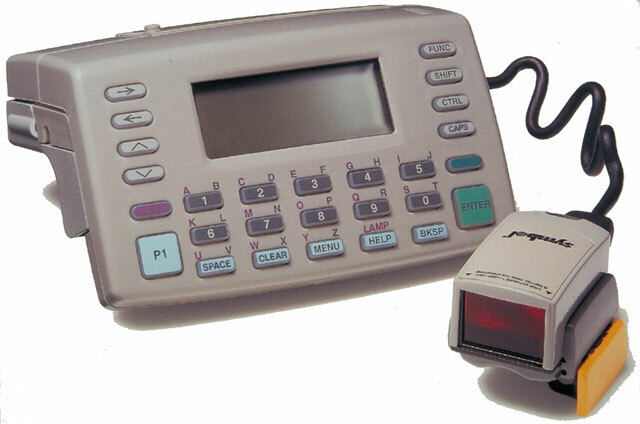 The WSS 1040, WSS 1049's computer is worn on the forearm and includes a CPU display keyboard battery pack and optional batch or wireless communications. Tasks that involve the movement and tracking of physical objects will never be the same again. Symbol Technologies has created the ultimate workstation. Coupling powerful information gathering and processing capabilities with simplicity and ease of use, it is enabling quantum improvements in productivity while delighting users with its comfort and light weight. The WSS 1000 Wearable Scanning System. Nothing else comes close for form, fit and function. Nothing else can so dramatically increase the efficiency of your workplace. Symbol Technologies' WSS 1000 Wearable Scanning System empowers users to achieve totally new levels of productivity and accuracy. At the same time, advanced ergonomics make the system easy to use and comfortable to wear. Never before could scanning, portable computing and wireless networking be performed while the user's hands remained totally free for handling packages, products, inventory or materials. The WSS 1000 System also represents breakthroughs in miniaturization, performance and data transmission. Already, its all-encompassing capabilities are changing the definition of productivity and ease of use in warehousing, transportation/logistics, manufacturing, retailing and other industries. The WSS 1000 System consists of two components. The RS 1 Ring Scanner is worn on the index finger and activated by pointing the finger at the barcode, while pressing the thumb against a trigger at the base of the finger. Scanning is performed by pointing the finger at the barcode and activating the scanner by pressing the thumb against a trigger at the base of the finger. The RS 1 Ring Scanner is the smallest wearable laser scanner in the world, weighing only 1.7 ounces/48 grams and standing just .9 inches/23 mm high. Spectrum One® - A fast, interference-free wireless network solution featuring a high- performance cellular design for reliable throughput while providing excellent long-range operation and data security. Spectrum24® - Symbol's next-generation wireless LAN featuring a more robust environment for larger, more complex networks. This inherently secure architecture is ideal for business-critical applications requiring high levels of data throughput. The WSS 1000 System is engineered to perform. The RS 1 Ring Scanner features a rugged and reliable laser scanner that scans quickly and accurately-even if the barcode is damaged or poorly printed. Its tiny scan engine permits a low profile design, allowing it to avoid most bumps and knocks. But, we've given it a scratch-resistant coating on the window just in case. The wrist computer offers powerful information gathering, processing and communications performance, yet is easy to use. It features a programmable keyboard and backlit display, both optimally positioned for effortless keypad input and viewing, even in dimly lit environments. It weighs just 9.5 ounces/279 grams and is powered by a long-lasting lithium ion battery. The ring scanner and computer are connected via an unobtrusive, lightweight cable. When it comes to productivity, comfort and ease of use are every bit as important as performance. Symbol's design engineers thoroughly tested the WSS 1000 Wearable Scanning System, putting it through more than 40,000 user test hours with active participation from customers. The result is maximum comfort and flexibility. The RS 1 Ring Scanner fits fingers of all sizes and it's reversible, allowing it to adapt equally well for right-and left-handers. The lightweight WWC 1000 Wearable Wrist Computer adapts to fit every wrist. Both the ring scanner and wrist computer mount to straps that stay with each operator, eliminating worries about hygiene. Safety's not a concern, either, because the ring breaks away under 20 pounds/9 kg of pressure. The WSS 1000 Wearable Scanning System from Symbol Technologies: In handling-intensive, high-throughput environments, it's what the empowered workforce is wearing. Miniaturized ring scanner and wrist-mounted computer keep operators' hands free for moving, picking, packing or receiving packages, products or materials. High-performance laser scanner and superior ergonomics allow fast "aim-and-shoot" operation, even on poor quality barcodes. Scanning range is from 4 inches to 25 inches/10 cm to 64 cm. Wrist computer has a 27-key alpha-numeric programmable keyboard, 4- or 8-line x 20-character display and RF data transmission for advanced computing and communications. DOS compatibility means easy integration. Superior ergonomic design includes "personal" attachments for hygiene, adjustable straps for comfort, ambidexterity for right or left-handed operation, and breakaway feature.